It's time to upgrade that warped copy of The Darwin Awards you keep by the can with PadPivot, the mobile device stand that lends hands-free support to your iPad, e-reader, tablet, or smartphone. Through its SureGrip nano suction technology, PadPivot "aggressively adheres to glossy surfaces", so you can peruse endless cat videos while you take care of your business. PadPivot's uses also extend beyond the bathroom. It can also help you follow recipes while cooking, bring up chords while fumbling with your guitar, or video chat as you do cartwheels around the room. 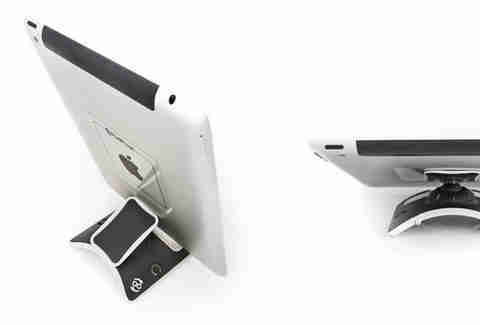 Plus, it folds easily into a pocket or briefcase, making it portable for hands-free-ness on the go. Don't believe the hype? Just look at how much fun this guy is having with his PadPivot! Editor's Note: This photo has been doctored in the name of lame masturbation jokes.